Content wise, this is a wonderful book--life changing even. However, I know that the style that Ann Voskamp uses won't resonate with all readers--could even turn some people off by it--so that's why I dropped a star. Towards the end of the book, I found myself skimming to get to the "meat" of the chapters. Call it ADD or call it reading too fast to absorb, but I had a hard time with several of the end chapters. And then, when I was done, I wanted more--not because her story is lacking but because I was still processing. My advice? Read only a chapter a day and give yourself time to enjoy the story and to process the content. I think I would have enjoyed it much more if I had not rushed through it. The main theme of this book is thanksgiving--or eucharisteo--and Voskamp touches on how gratitude is central to finding joy in the midst of sorrow and how the behavior/attitude of thanksgiving draws us into deeper relationship with God. Voskamp also writes about the "hard eucharisteo," of seeing God's grace in all things--even in the midst of tragedy. It's a difficult concept to consider, but I think it's timely for today's church. Overall, I highly recommend it! Just make sure to give yourself time to read through and process it. I know I have a lot to think about now that I've finished reading it. 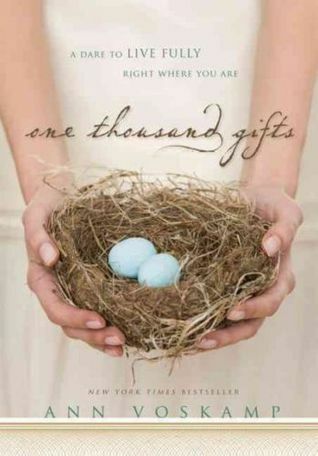 Sign into Goodreads to see if any of your friends have read One Thousand Gifts.